This surname is of Anglo-Saxon origin, and is a locational name from any of the various places in Cheshire, Northamptonshire and Suffolk called "Hargrave" or "Hargreave" recorded in the Domesday Book of 1086 as "Haregrave" and "Haragraua" respectively. The meaning can be derived from either the Olde English pre 7th century "har", meaning grey or "hara", meaning "hare", plus the element "graf", grove, or "groefe" meaning a thicket. Locational surnames were developed when former inhabitants of a place moved to another area, usually to seek work, and were best identified by the name of their birthplace. Early examples of the surname include: William de Hargreve (Lancashire, 1296), and Henry Hargrevys (Yorkshire, 1486). 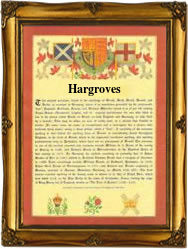 In the modern idiom the name is spelt Hargreave(s), Hargrave(s), Hargreves and Hargroves. Probably the most notable bearer of the name is James Hargreaves (died 1778), inventor of the "spinning-jenny" circa 1764. A Coat of Arms granted to the Hargreaves family of Broad Oak, Lancashire, is a shield divided quarterly gold and green, on a fesse ermine between three stags courant counterchanged, a red fret. A green buck's head erased, attired gold, with a silver collar charged with a red fret, in the mouth a sprig of oak, forms the Crest. The Motto "Fortitudine et prudentia" translates as "By fortitude and prudence". The first recorded spelling of the family name is shown to be that of Geoffrey de Hargrave, which was dated 1188, in the "Pipe Rolls of Devonshire", during the reign of King Henry 11, known as the "Builder of Churches", 1154 - 1189. Surnames became necessary when governments introduced personal taxation. In England this was known as Poll Tax. Throughout the centuries, surnames in every country have continued to "develop" often leading to astonishing variants of the original spelling.